Getting the same (or similar enough) results more quickly with less fuss is a win win in my book. I use the "WHAT IF" approach to designing quilts often but I have discovered that it can apply just as well with construction. Quarter Circles are a graphic, versatile design element and quite on trend. Easy to love but not all that fast to make with the usual required method of marking and cutting. 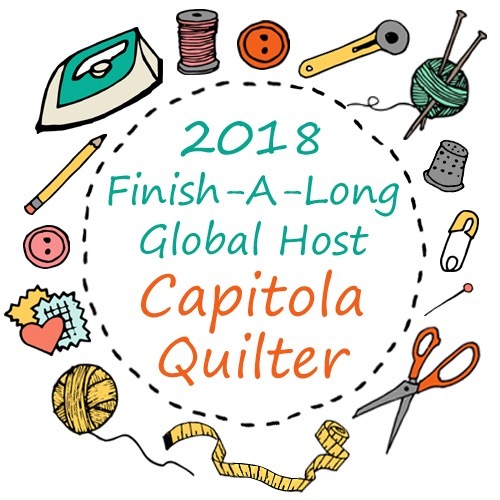 Today is my turn on the 2018 Q3 Finish-A-Long Tutorial blog hop. I am sharing a technique for Power Prepping Quarter Circles for those of you who have more projects than minutes of the day like me. Cutting multiple layers can be tricky so be SURE that you stay within your skill set and do not attempt more than you can safely execute. Use a brand new blade and take all of the usual precautions like keeping yourself ergonomically positioned with your precious fingers away from the rotary. An alternative is to use freezer paper templates (pressed with a hot iron shiny side down) and sharp scissors. For this tutorial I used 10" pre-cut layer cake squares but folded yardage cut into squares works too. Refer to steps 1-3 above. Stack the number of layers you are comfortable with and Baste a straight line corner to corner in both directions creating an X. 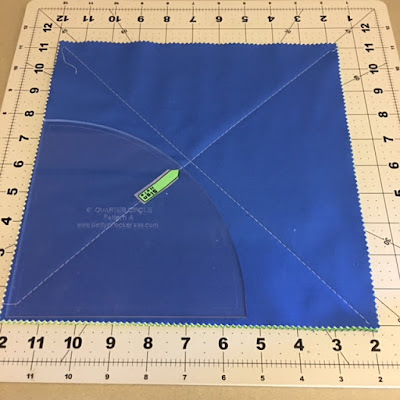 Use a walking foot and/or adjust your machine setting for the correct fabric thickness during this step to reduce shifting and puckering however some distortion is fine. Position the template as shown. Tip: If your template is not already marked, you can indicate the middle point as I have done. Cut the curve and straight edges on of the concave template and convex template. Using a rotating mat is nice but not necessary. Simply reposition the parts as you go through the steps for an optimal ergonomic approach. Because they are tacked together with the stitch lines, there's no worry about them wiggling out of place while handling them. 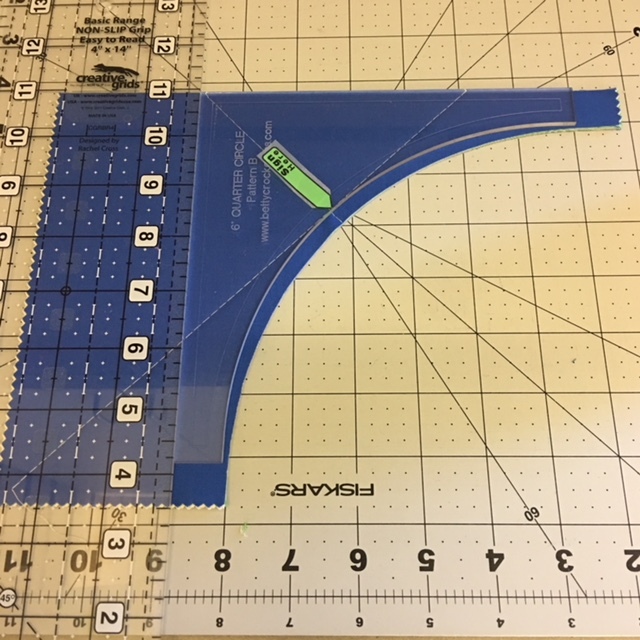 You can either cut along the template edge, or place a second ruler to position on the cut line and move the template away to cut as shown above and below. I personally like to have a more substantial ruler that extends further than my target shape to hold onto when cutting a straight edge of multiple layers. When you place the template back on the stack for the final cutting of the end tabs, it can be a little awkward. I find that "rocking" my rotary blade cut works well for small areas like these. Did you think the Basted X was just to give stability to the stack and allow you to cut a bunch at a time instead of just a couple? Well, it was that and more - read on. Using a seam ripper, unstitch the Basting thread and reveal the needle holes. Your lovely big batch of concave and convex parts are ready to be sewn together using the needle holes for matching up as you stitch, pin or glue! Being able to not only see but feel your target point is great. Isn't it wonderful how little waste there is? The cut offs from a 10" are large usable chunks and ready to be incorporated into the quilt or the beginning of another! 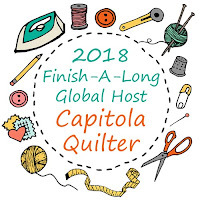 If you are a super precise quilter and perfection is your sewing threshold or you geniunely enjoy the steps of marking, notching, gluing or pinning when making half quarter circles, this tutorial might leave you shaking your head and rollin' your eyes. No judgement here - that's okay too. Remember to link up your Q3 finishes (ends October 9) and start putting together your Q4 goals because that linky opens October 10th. Leave me a comment with time saving tips and tricks that you have discovered to eliminate or expedite steps - I'd love to hear! Okay, that is plain awesome!!!! Very clever! Must give this a try -thanks! That is one fantastic way to make accurate curve blocks. Thanks. I will be using your method. Brilliant with the basting stitches. Thanks so much for sharing your method! Well this was extremely clever Karen! Well done!